So, I know there are pin cushion tutorials all over blogland, but I was looking at the scads of soda cans I've been keeping around for soda can bracelets and had a little idea. And I can't keep ideas to myself, so here's my little version of a pin cushion, inspired by oh so many people. 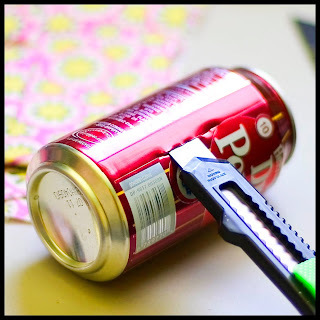 Carefully put a slit vertically in your soda can, leaving about an 1 1/4" at the bottom. Cut the top off your can with a pair of scissors to make the bottom easier to remove. Cutting as straight as you can, cut the bottom off your can. This is the part we are interested in. Be careful. Cans are sharp. 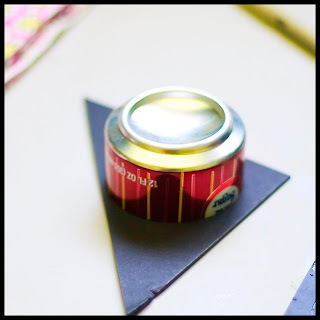 Turn your can over onto your cardboard and trace a circle. 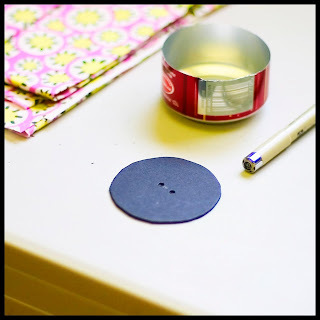 Cut out circle slightly smaller than traced line. Make sure it fits into your can easily. If it doesn't, keep trimming until it does. 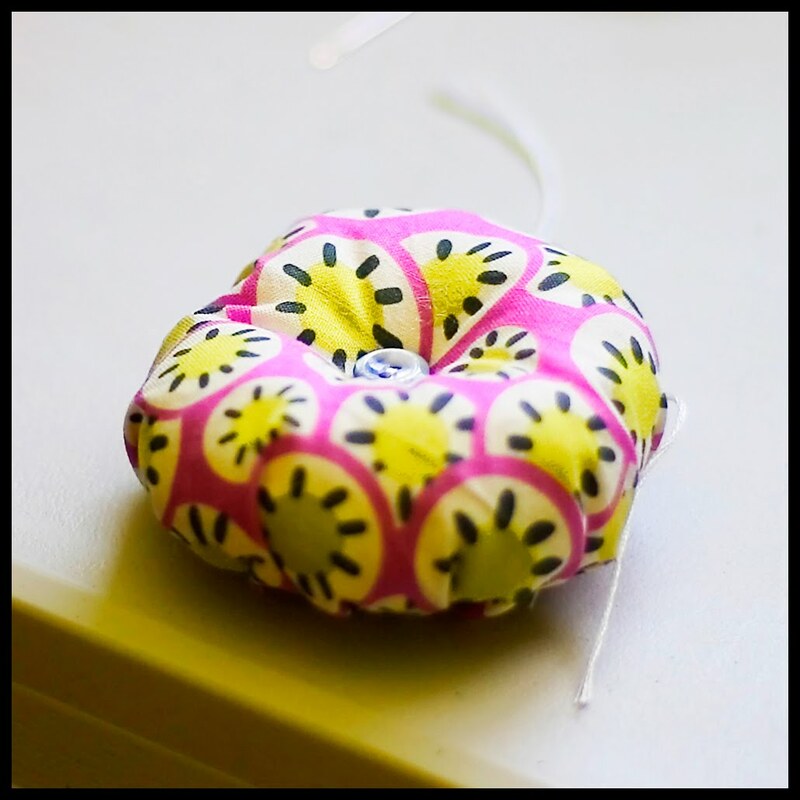 If you want a button tuft in your cushion, punch two holes in the center of your circle. Set aside. Someplace safe. But not too safe, you don't want to forget where you put it (I always do that!). Cut a circle out of your fabric. 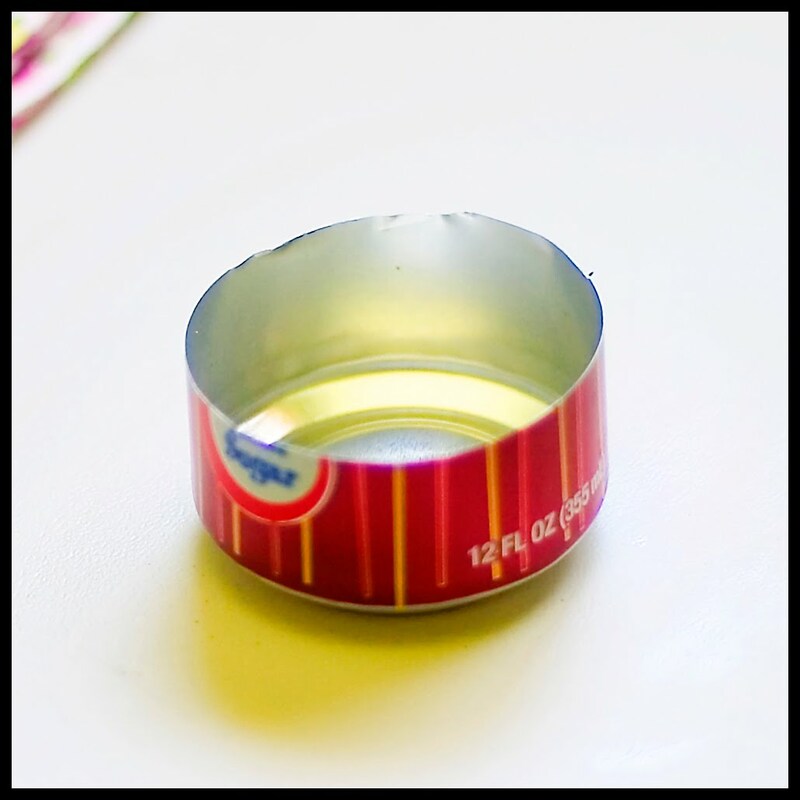 You want it approximately 2.5 times the diameter of your can, or between five and six inches. I used a bowl to trace mine. The nice thing about this is that it doesn't have to be exact, but somewhere around there. 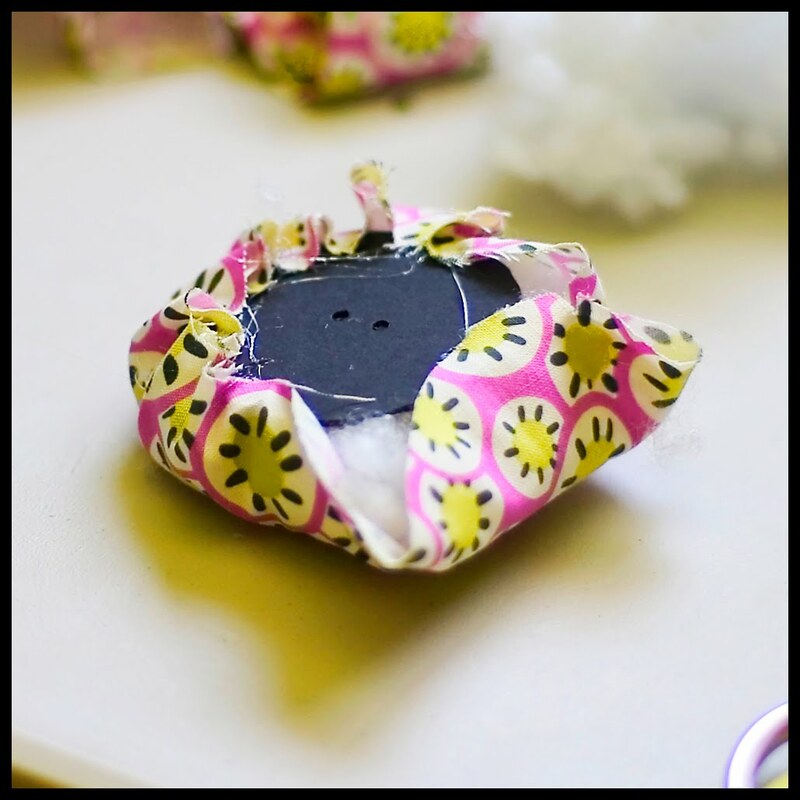 If you're putting a button on your pin cushion, fold the circle in fourths, and mark center with a fabric marker. Using hot glue, attach the fabric to the cardboard circle at four points, with the right side of the fabric facing outward. Start stuffing it. As it gets fuller, glue one side shut. Stuff quite full. Glue fabric all the way down, closing all the openings. 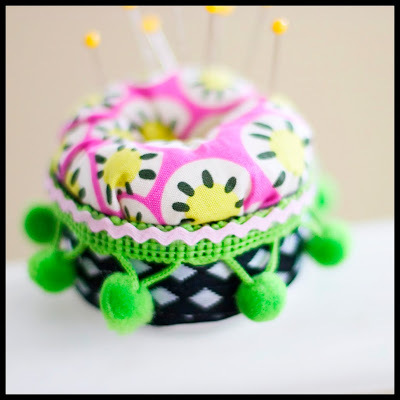 If you want a button tuft, thread a needle with thread. 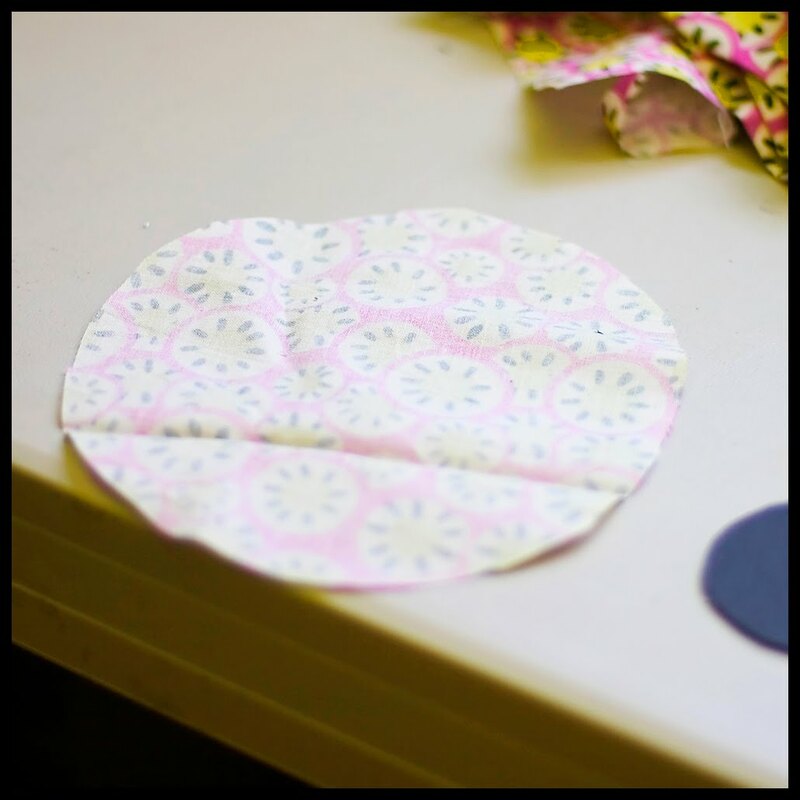 Come up from one of the bottom holes and to the hole you marked in the center of your fabric. 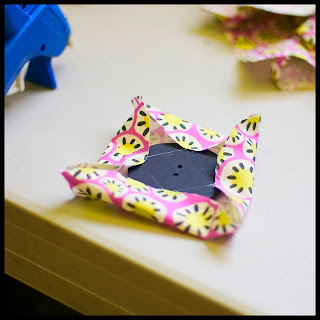 Thread the button on and come back down the through the button hole and out the 2nd hole in the bottom of the cardboard. Tie down. 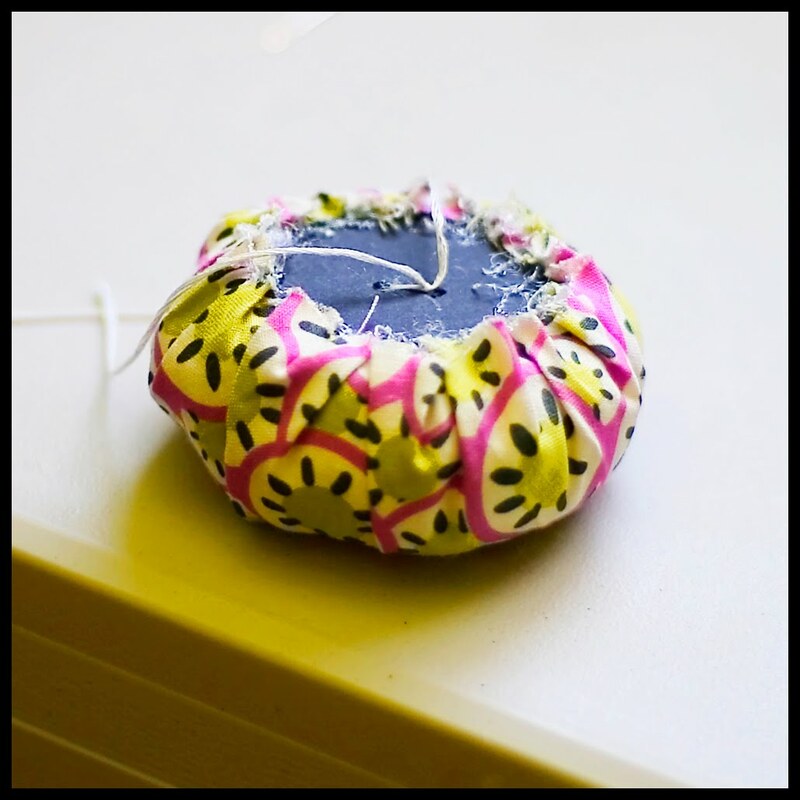 Don't tie too tightly, or your button will disappear when put into your can. 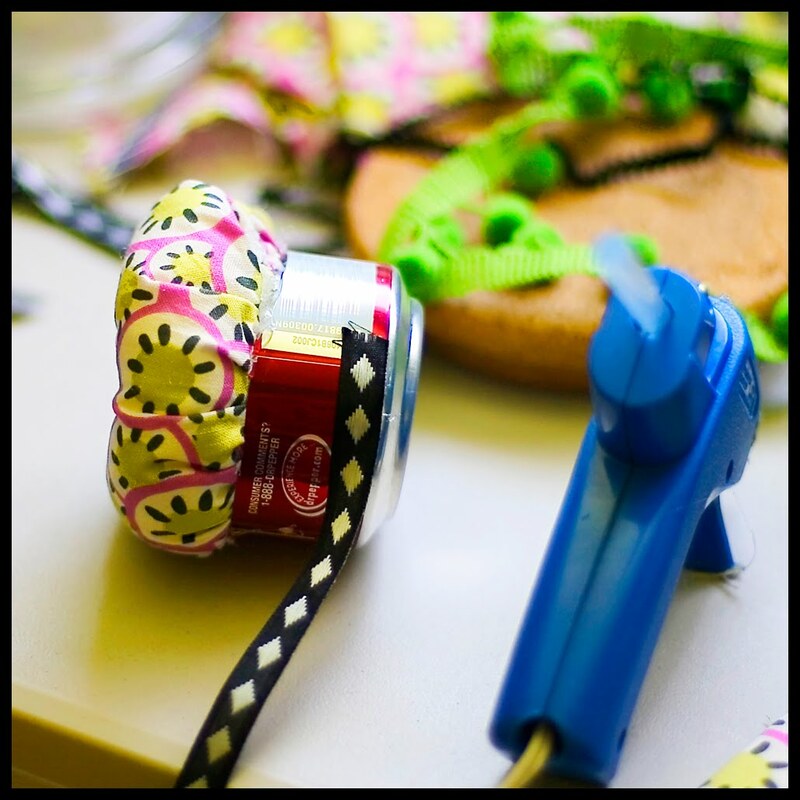 Go through the button a few more times for added strength, then make a final knot. Trim ends. I tried to take pictures of this, but failed miserably. I hope the description and the finished photos are enough to get the general idea. Dry fit into your can. You kind of have to squeeze it a bit (or a lot) to get it in. If it looks good, put hot glue on the center of your cardboard and stuff it into the bottom of the can. If it doesn't, perhaps I have led you astray. 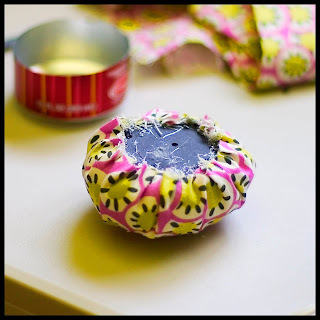 One thing I did wrong the first time was not put the poofy thing far enough into my can. Starting at the bottom, hot glue ribbon around the can to cover up the print on the can. 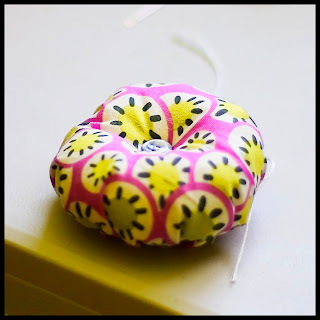 Work slowly and spread the glue a little so you don't get lumpy glue. Add any other trim you might want. Add pins. I really want to make some more of these. Considering my propensity for making everything in sets of twenty lately, I think I see at least a few more in my future. OMG this is SOOO cute!! 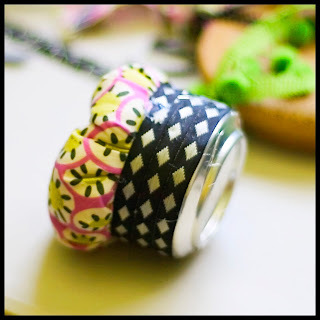 What a good idea, it's really cute! Actually, a great idea. Maybe for little gifts for our crafty friends at Christmas? I know it's only Aug and I'm already talking Christmas, but if I don't start now- they won't get their gifts til Spring. Cute! 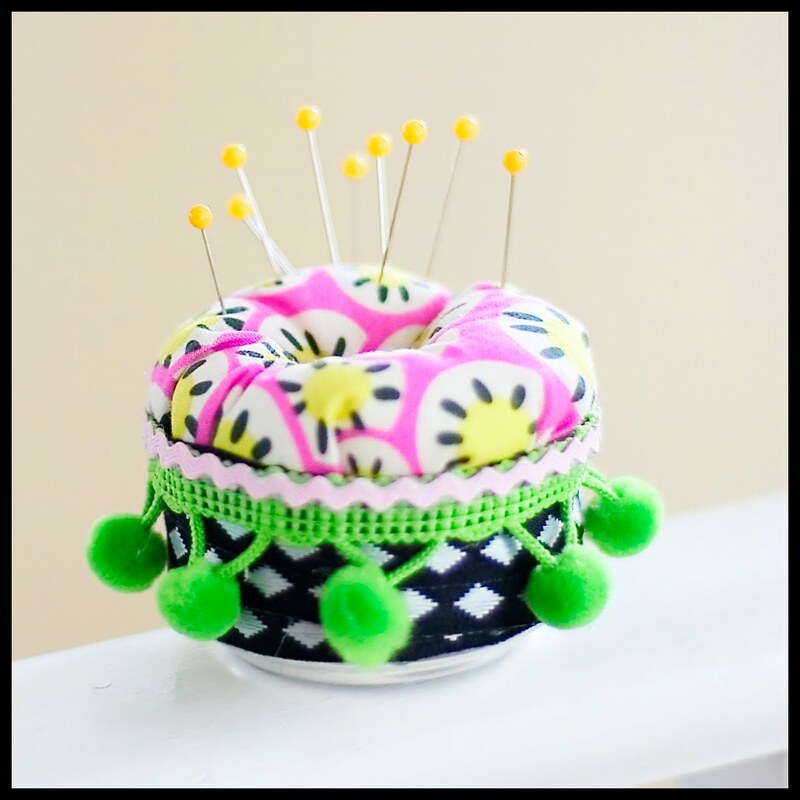 I have seen several pin cushions I would oike to try to make. 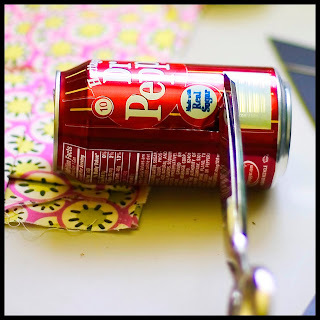 This one is cool because you use a recycled can. Cute cute!! I am totally going to have to add this to my "to do" list! This is simply ADORABLE!! 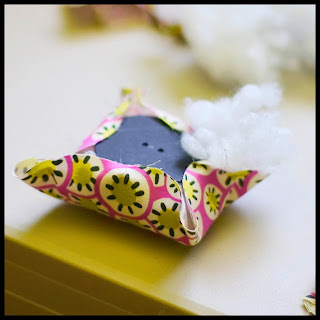 I never would have thought of such a fun creation!! 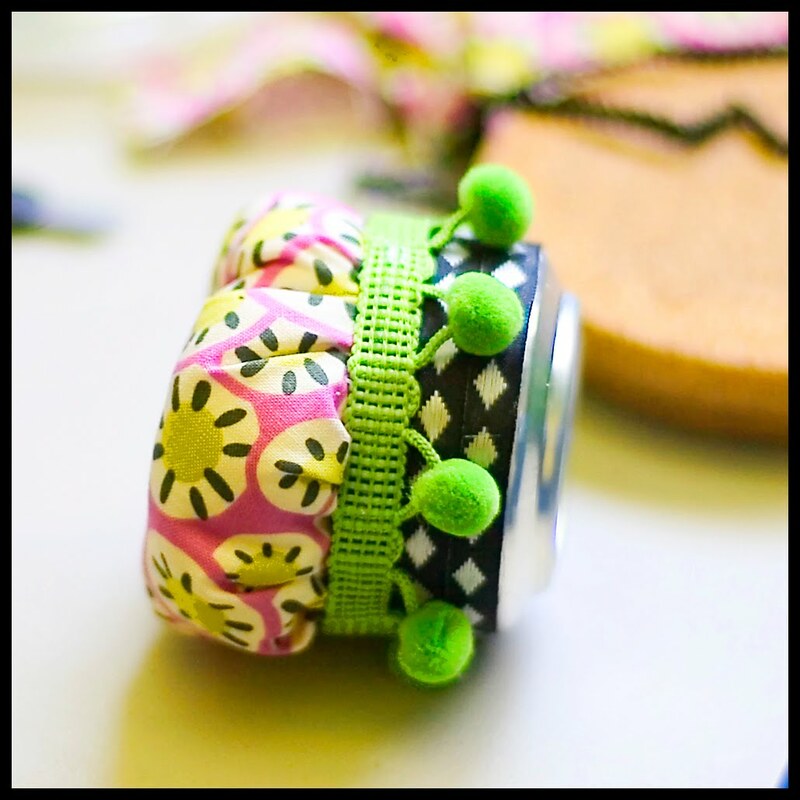 I love your blog and I'm happy to be your newest follower...I love new friends too! I would also like to invite you to my link party/giveaway every Friday at FrouFrouDecor! Hope to see you there! So danged cute, Kara! Betcha they'd sell on Etsy. Been a long time but glad to see you're still creating.